Home to several colleges, Birmingham, Ala., has a deep-rooted pride in its higher education system alongside a deep-rooted Southern history. One home here brings together both of these ideals; it was built in 1920 and is now owned by a local college professor and her husband, who like to have students over for meals and discussions. 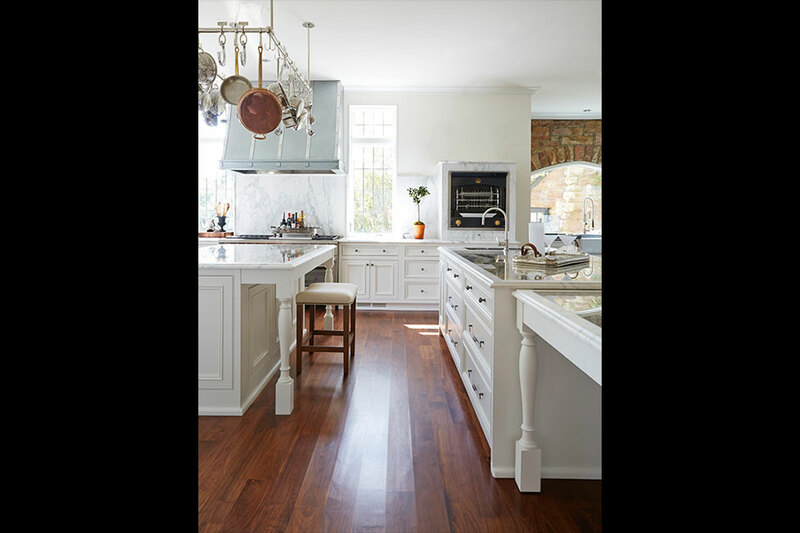 However, the dated kitchen in this English-style home needed help before it could play host to educational meetings and student guests. Before the redesign, the kitchen layout fortunately was already poised for an ideal open-concept design. The floor plan was split up into three rooms: the kitchen, a family breakfast room and a butler’s pantry to service the dining room for dinner. All that was needed was to take down the walls. The tall cabinets reached to the top of the 10-ft ceilings, which compensates for the lack of wall space. Cantley also added more wall space by removing the fireplace in the family breakfast room. 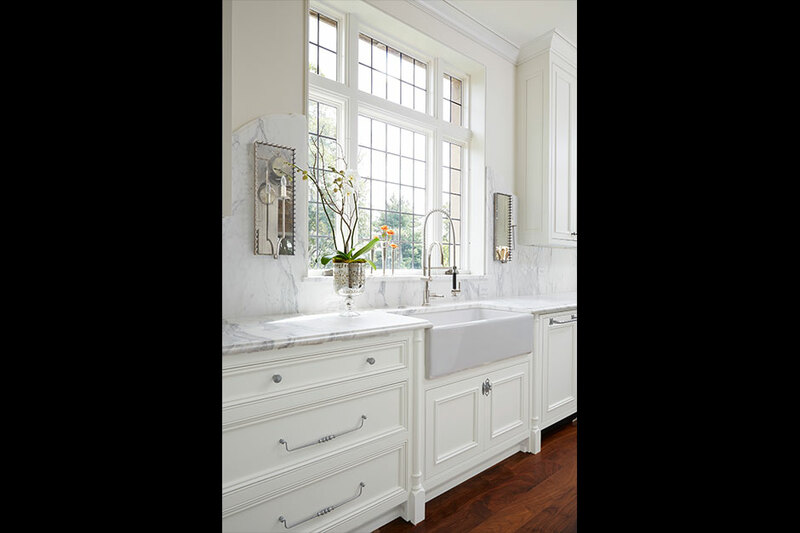 The new white-painted cabinet doors were custom made by the designer, and one section of cabinetry includes leaded glass windows to display china. This glass echoes the original windows at the front of the English-style house and adds texture to the perimeter of the kitchen. To help fill up the now open space in the center, two islands were installed to establish a separate prep area and a seating area. The longer island features a built-in table that can be pulled out and stood alone, creating more options for entertaining. The outer island hosts the refrigerator drawers, an icemaker and a microwave. Together, these two islands allow more table space for students to gather around and have discussion. The islands also feature a unique surface material: onyx. This dramatic blue and green stone was a favorite of the designer’s, and she knew immediately when she saw it that she wanted to include it in this design. She chose to put the onyx on top of both islands, making them even more of a centerpiece in the space. White marble was in the original butler’s pantry, so the design team sourced local marble to border the onyx countertops and strengthen them. 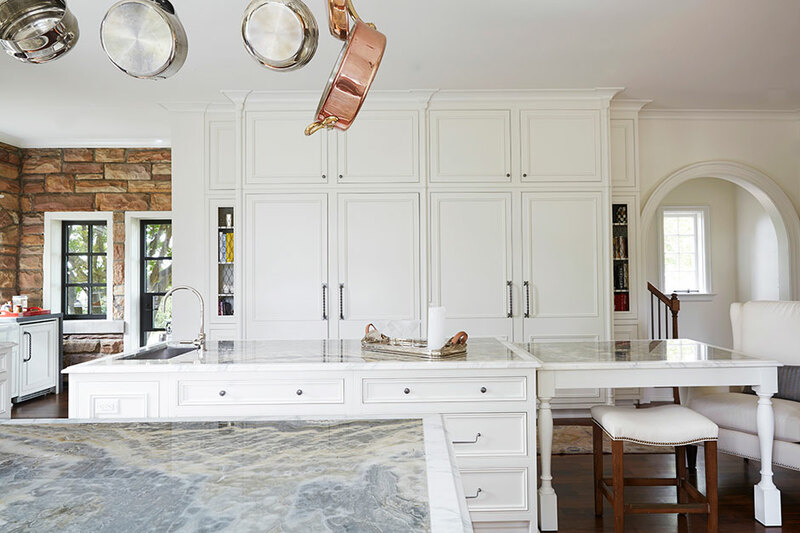 The same marble was also used around the perimeter of the countertops, complementing the classic cabinetry in the rest of the kitchen. 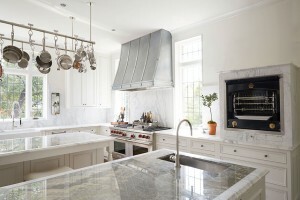 “I wanted to stay in keeping with the English architecture of the home, and I love the beauty and simplicity of the English inset cabinet doors our company has always been known for,” said the designer, explaining that traditional English cabinets feature doors and drawers that fit inside of the cabinet face frame openings for a full view of the cabinet frame. The design team also incorporated lighting that echoed the home’s roots. Hanging on each side of the sink, two sconces with antique mirrors not only coincide with the classic architecture of the home, but they create shadows that add a vintage touch to the kitchen. Recessed dimmers are used throughout the rest of the kitchen, since there is abundant natural light coming in through the windows.